Welcome back to Apple Week...or more appropriately known as Apple Week plus a few more Apple Days. I just couldn't seem to keep it to a week...or uh should I confess I couldn't bust out the posts as quickly as I thought. I tell you what people, life has been crazy. I would go into the oh-so-glorious details, but in short it all comes down to being a mom is super time intensive, I have four rowdy awesome boys, and being their mom is always my top priority. So Apple Week turned into a week plus, but hey that is okay, right? I mean it is kind of like getting a birthday card a couple of days after your birthday, it just prolongs all the birthday festivities and goodness. A win win for everyone involved really. More apples, more birthdays, more goodies. Huzzah! Apple Cider Caramels to be exact. Oh I think we shall! I love caramels, and these kind of made my whole day. 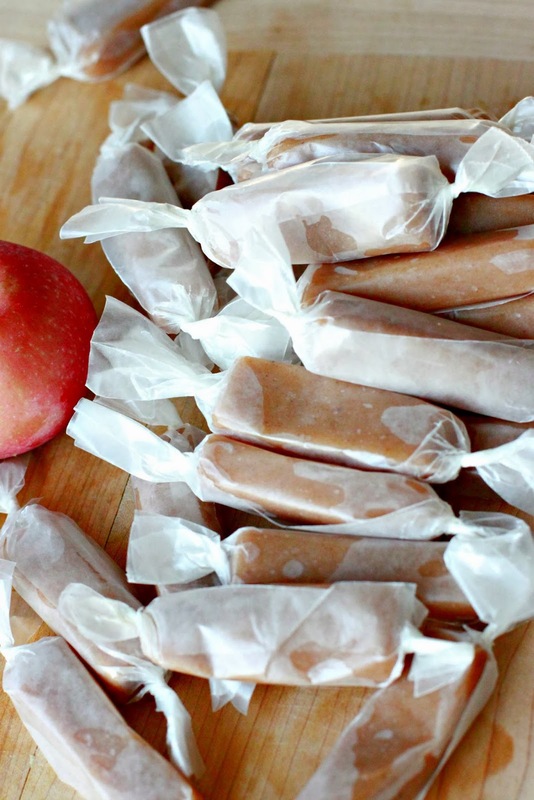 Like a little concentrated cup of Apple Cider all rolled up into a soft and chewy caramel. Why I don't mind if I help myself to one.. In a saucepan, boil the apple juice down for about 20-30 minutes until it is reduced to about 1/3 cup. Set aside. Line an 8x8 pan with parchment paper. Lightly grease the parchment paper. In a bowl, combine 2/3 cup of the cream, the spices, and the reduced juice. Set aside. In a heavy pot, combine the sugar, 1/3 cup cream, water, and corn syrup. Cook over low eat until the sugar dissolves. Using a candy thermometer, simmer until the syrup reads 230 degrees. Remove the pan from heat and whisk in the cider and cream mixture. Add in the butter and continue to whisk until it is completely combined. Return the pan to the heat, cook over low heat, stirring frequently until the temperature reads 244 degrees (soft ball stage) and then cook for another 2 minutes. Remove from heat and pour the caramel into the prepared 8x8 pan. 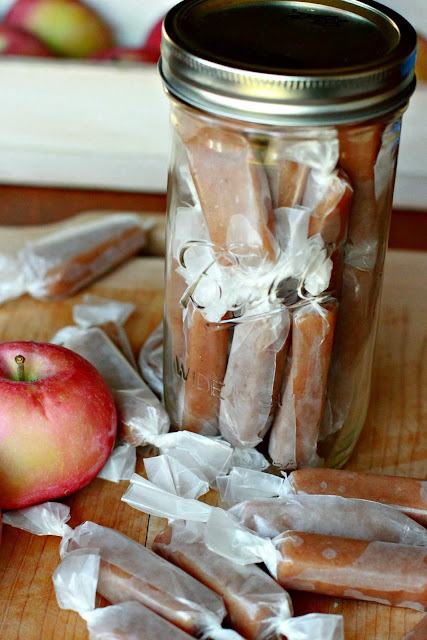 Let the caramel cool completely at room temperature. 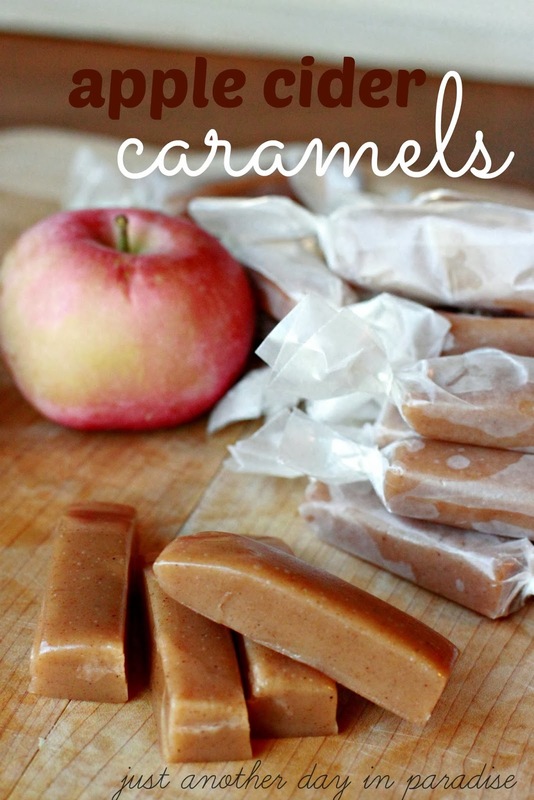 Once cooled, cut the caramels into squares or rectangles. Then wrap in wax paper. Almost licking the screen. I can't wait to make these!!! ps, did you get my email from awhile back about freebie teacher appreciation ideas I've seen? Yum! Now if I could just bring myself to workout like you, I could justify cooking like you!